"Who Else Wants To Learn A Simple, Step-By-Step 'System' For Saving Tens Of Thousands Of *Dollars By Legally Avoiding Taxes?" "How Real Estate Investors Can Pay Zero Taxes!" Yes, it's true. Tax law is designed to encourage real estate investment and so investors are granted special tax privileges. These tax "loop holes" are available for each and every investor who will take the time to learn about them. Just a little knowledge can be the difference between pocketing thousands of dollars.... or passing those same dollars to Washington politicians and their spending programs. How many times have you heard some politician scream that this or that tax feature benefits only the rich? Wait a minute! This is an equal tax avoidance country and what's good for the rich is also good for us little guys. The difference is that the smart and wealthy take the time to learn about the available tax breaks. Now it's your turn to catch up with the rich real estate investors and know what they know. One of your most powerful tax avoidance plans is now revealed in "How Real Estate Investors Can Pay Zero Taxes". It all starts with understand how to multiply your profits using 1031 Exchanges. That idea scares beginning investors and that's a shame, because exchanging is one of the keys to wealth in real estate. Every single real estate millionaire has used 1031 Exchanges to turbo power his/her investing program. And, guess what, IT'S EASY! No kidding. For the small real estate investor 1031 Exchanges are a piece of cake. There are a few rules that have been laid out by the IRS. These rules are like an easy to follow road map to a successful and profitable real estate exchange. Anyone can do it - everyone SHOULD do it. "Flipping" property is all the rage now. That's a nice way to generate some immediate income, but true real estate wealth comes with a buy and hold strategy. BUT... you must have a knowledgeable buy and hold plan. Leverage is the secret door to financial success. That means you buy and hold until your equity reaches a point where your leverage is diminished. Then it's time to roll that profit into another property using a 1031 Exchange. You buy and hold an "investment", not necessarily a particular property. Example: You invest $10,000 into a property - that $10,000 is your "investment". After three years a combination of appreciation, depreciation and mortgage pay down reduces the percentage return on your $10,000 investment. It's time to move that investment into a more profitable property to regain maximum leverage. You do that free of capital gains tax by using a 1031 Exchange. See, you are still working that initial $10,000 dollar buy and hold "investment", but by understanding tax law you can keep it earning the highest rate of return possible. 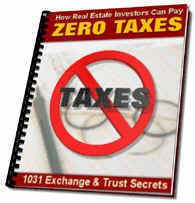 "How Real Estate Investors Can Pay Zero Taxes" is a manual that explains how simple exchanging can be. But that's just the beginning. Some people find this hard to believe, but it's really true that anyone can get rich in real estate of they are willing to devote themselves to doing so. All it takes is some basic knowledge and unrelenting determination. Part of your plan should be not only financial success for yourself, through the use of tactics like 1031, but to pass your wealth on to future generations of your family - tax free. Here again all you must do is follow the lead of the rich and famous. "How Real Estate Investors Can Pay Zero Taxes" explains how to first use a Charitable Remainder Trust to protect and profit from your hard won wealth, and then establish a Foundation that can be of benefit to your heirs. That's exactly what the financially sophisticated do. In fact, take a close look at those who keep saying "It Only Benefits the Rich" and I'll bet you will find that the majority of them are being advised to do the same thing we are talking about here. They didn't get to be powerful and rich by being dumb. Not to understand and use these tax avoidance techniques is like walking around with your money in a bucket that has a hole in the bottom. Sure you have a bucket full of money, but you'd keep more if you would just patch that hole! Please add "How Real Estate Investors Can Pay Zero Taxes" to your investment library. It will open your thinking to a world of tax free possibilities. The price is only $37.00. You can choose to buy the manual on handy CD ROM, as an Ebook for immediate download or the printed version. They have identical content. These tax advantages are right there waiting for you. Your hurt yourself and your future by not understanding their profitable benefits. Do the smart thing and buy now... before you lose this page and more tax cash! "We are so confident that you'll love this Zero Taxes course, if you're not happy for whatever reason you can request a refund and keep the downloaded Ebook as our way of wishing you all the best! Choose any of the purchase options below..."
NOTICE! I want to make you a No Risk Offer! If you will order "How To Profit With Land Contracts!" right now, before you lose track of this Web site, I will give you an 30-Day, Money Back Guarantee! All I ask is that you spend three months putting the plan into action. Don't just read the manual. Take what you learn and start building your future! It's fun to be successful and make money. I know you can do it! We reserve the right to raise the price or withdraw this offer without notice, so don't be left out. Order now!